There are not a lot of rare nickels and they are fairly inexpensive, which makes them a great coin series for the beginner or those with a modest budget to collect. You can put together a nice collection without spending a lot of money. In fact, a lot of the Jefferson Nickel series can still be found in circulation. Who knows, you might even happen across a very unique rare nickel just like Mr. Ken Frith did. 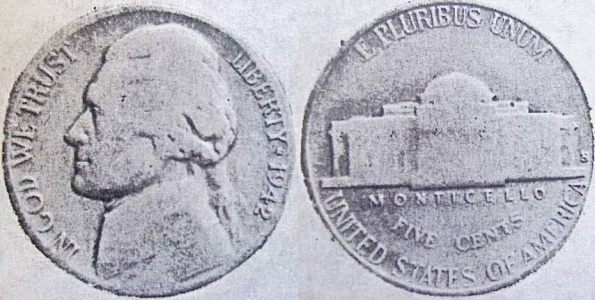 In 1961, knowing that Mr. Frith specialized in error coins, a very unique 1942-S Jefferson Nickel was brought to his attention. After carefully examining the coin to make sure it was not a fabrication, Mr. Frith purchased the coin. This is a coin that was struck from two dies not intended to be used together. For example, it would have the front (obverse) of one denomination or coin type and the back (reverse) of another. These are very rare. with a 1941-S reverse. Click Here to read more about Mr. Frith's exciting discovery. Find out how he knew that someone at the mint had made a huge error. You will also see the documentation sent to me by Mr. Frith which details all the steps that he took to verify that this was truly an authentic mint strike coin. See actual copies of letters, a newspaper article in the New York Times, and a copy of the page from the auction catalog where the coin was described for auction. Then, get out your nickels and start searching for your own keydates and error coins!! Below you will find the keydates for each type of nickel along with information about error coins that you should keep an eye out for. Shield Nickels are going to be the most expensive of all the nickel types if you choose to collect them. Very worn coins will cost you around $20 each. A collection of Liberty Head Nickels is quite possible on a modest budget with the exception of the keydates listed below. 1913 - Only 5 are known to exist!! Most Indian Head Nickels are also moderately priced and within reach of the average collector. With only one keydate and a couple of semi-keydates, a collection of Buffalo Nickels could be put together on a fairly small budget. The Jefferson Nickel series doesn't have any major rarities. This is one reason it's such a good series for a beginner to collect (or anyone on a modest budget). Full Step Nickels: Jefferson nickels that have "full steps" on the reverse sell for a premium. 1942-S with the reverse of the 1941: the rarest Jefferson Nickel. Only one is known to exist. Wouldn't it be cool to find one of those in your pocket change! Click here to read more about this exciting discovery. Return from Rare Nickels to Jefferson Nickels. Learn more about the one of a kind 1942 Rare Nickel described above. Learn where the mint mark is located on Nickels and other US Coins.